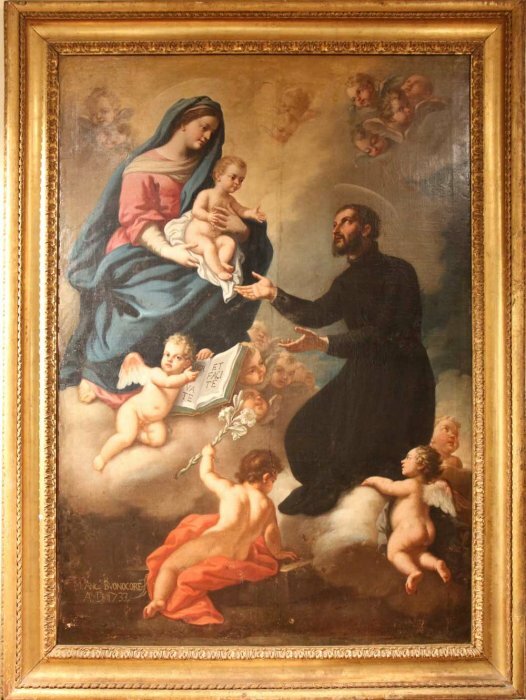 Today is the feast of St Cajetan, the founder of the Clerks Regular of the Divine Providence, the very first order of Clerks Regular. They are usually referred to as the Theatines, since one of the other founders, Gian Pietro Caraffa, was bishop of the city of Chieti, “Theate” in Latin, in the Abruzzo region; he would later be elected Pope with the name Paul IV (1555-59). Cajetan himself was born to a noble family of Vicenza in the Venetian Republic, but spent much of his life in Rome. The name “Clerks Regular of the Divine Providence” refers to the fact that, in imitation of the poverty of the Apostles, whose spirit they hoped to revive in the Church, they neither begged like the mendicants, nor accepted permanent endowments like the monks, but lived on whatever might be offered to them spontaneously by the faithful. It may fairly be said that Cajetan’s ministry in Rome, and that of his order, which was certainly important, but never very large, has been overshadowed by his near contemporary St Ignatius, the founder of what would become a vastly larger and more widespread order of Clerks Regular, and by St Philip Neri and the Oratory in the following generation. This is partly because the Council of Trent was only just getting started at the time of his death; St Cajetan belongs to the generation whose good example in evil days would lay the groundwork for the sweeping and highly effective reforms of the Counter-Reformation. After founding a house of his order in Naples, St Cajetan died there in 1547, and is buried in the crypt of the Theatine church of San Paolo Maggiore in the heart of the city. The Order tended to attract not just a large number of its vocations from among the aristocracy, but also a great many aristocratic patrons; it also did not unlearn the lessons imparted to the Church by earlier Orders like the Cistercians and Franciscans, that the poverty of religious is not practiced by impoverishing the house of God. The Theatines and their patrons built a number of very beautiful churches; those of Munich and Naples are particularly outstanding. Here then are a few photos of San Paolo Maggiore. The body of St Cajetan in the crypt of the church. 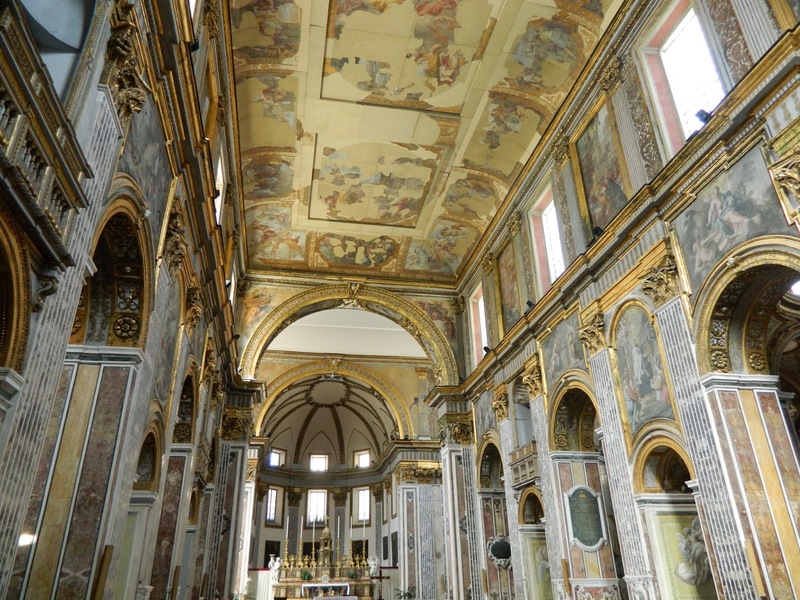 The church was badly damaged during the bombing of Naples in 1943, which caused the ceiling to collapse and mutilated the paintings on it. Note that the side chapels are isolated from the central nave, a typical feature of Italian Counter-Reformation churches. The Firrao Chapel, named for the family who commissioned it in the first part of the 17th century. Many churches in Naples have this style of elaborate polychrome marble work; this is known as a particularly fine example of it. The body of St Andrew of Avellino, a member of the Theatine Order who served as prevost of San Paolo Maggiore in the later 16th century. He died in 1608, and was canonized in 1712. From the top of the church’s steps, one sees the façade and bell-tower of San Lorenzo Maggiore, one of the most ancient churches in the city, and in the distance, a part of the Armenian church of St Gregory the Illuminator.